Space is available for rent as well. Please email for costs and availability. Give us a call or send an email and we will be more than happy to schedule training convenient to your schedule. Spend your day uncovering what you truly want to create in your life. As you peel back the layers of this thing called life, you will come to understand and uncover the areas of your life that need your attention. Through this process you will tap into your deepest desires and bring them forth to your conscious mind as you walk through your personal labyrinth. We will begin the day with an opening ceremony to bring in intent, awareness and create a sacred space. We'll address the nine areas of your life based on the Feng Shui principles and evaluate where your level of content is within these areas. Once the assessment is complete you will dig deeper into the wants and don't wants filtering your way to the process of co-creation. You will pin point your core desired feelings and learn how to bring the right energy vibration for manifestation. We will weave through the thread of life and create a labyrinth with your written intent. 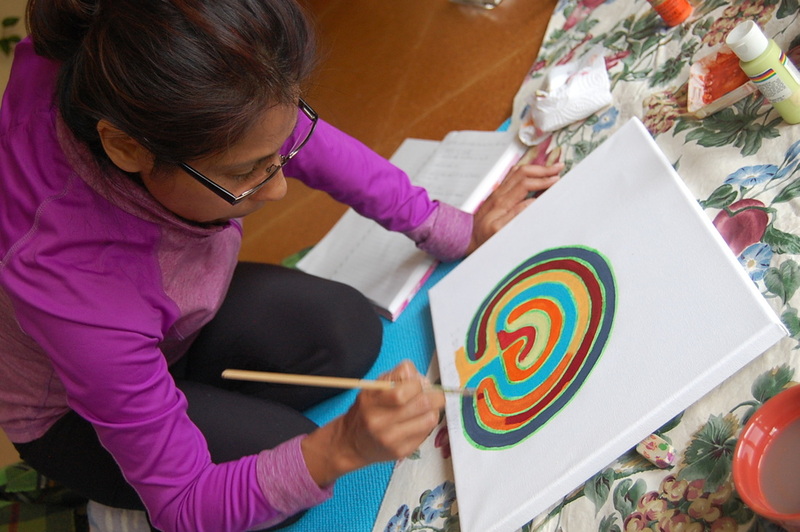 This process takes us through the 7 layers of chakras in the creation process. At the end of the day you will feel empowered, by learning to connect with your higher self, and experience the energy shift of the universal law of attraction. The world awaits your beautiful soul! Quite the opposite of “no pain – no gain”, the motto of these Steps To Transformation programs are “no pleasure – no treasure”. These programs are designed to create an environment of joy-filled energetic expansion and personal transformation. These IET Steps to Transformation programs will help you heal your trauma without having to relive the drama or pain. In these workshops, the Master-Instructor teaching the class will share their angelic energy connection with you, and teach you to establish your own energetic connection with the energy of the Healing Angels. You will learn to use ancient sacred geometry, combined with special techniques that Stevan J. Thayer channeled from Angel Ariel, to “get the issues out of your tissues for good!” In addition to experiencing these Steps to Transformation, you will learn hand mudras that will let you instantly re-activate them anytime. For the optimal transformational experience, we recommend you take the steps in sequence. Throughout his twelve years of facilitating Integrated Energy Therapy® sessions, internationally published author Stevan J. Thayer had many angels join with him and offered their healing gifts. He came to understand that these angels each brought a unique gift of healing and are delighted to be invited to offer you their healing gifts. Stevan has documented his work with these healing angels in a new book entitled The Healing Angels of the Energy Field. This book identifies one healing angel for each area of the human energy anatomy. It contains special prayers to invite each of these healing angels to work with you. It also provides a wonderful channeled message from each healing angel. This course will enable you to join together with other students and work as a team meeting and working with the Healing Angels. You will learn how to call upon the healing angels with a special prayer of invitation. You will then learn how to use an angelic heartlink to connect with the angels’ energy. You will discover the special healing gifts that each angel brings and you will invite each of the healing angels to support you in your physical, emotional, mental and spiritual healing journey. This course was developed by internationally published author Stevan J. Thayer, the founder and creator of Integrated Energy Therapy. IET is one of the next generation hands-on power energy therapy systems that gets the “issues out of your tissues” for good. Until recently, IET has been taught for self-use or for working with people. Now these same powerful IET techniques can be used to support cats, dogs, and horses! The word Reiki means universal life energy. Reiki is a form of laying on of hands healing with origins traced to Tibet. Reiki is a simple way of applying life force energy to relieve pain and speed the healing process, to vitalize, regenerate and balance all aspects of creation. It is a skill anyone can learn. There are three degrees or levels of the Reiki Ray. Each possesses a unique radiation of energy set forth for a specific purpose in healing. The first degree opens you to the ability to channel this energy freely and teaches a sequence of hand positions. Once initiated, it allows a person to channel Reiki energy for healing oneself and others. It requires no special invocation or alteration of the thinking process to "turn on" the flow of Reiki. By simply placing hands on and opening the heart to love, one automatically brings in the energy. The first degree is the foundation of all three degrees. The second degree requires further initiations for attunement to the keys utilized in this level. The student is trained to use appropriate Second Degree Key (symbols) which provide an increase of power from the Reiki Ray for absent healing including past and present (past lives etc.) and the healing of situations and mental/emotional healing. Almost all the symbols that are used in Reiki are Sanskrit symbols. Advanced Reiki level can be taught in conjunction with the third degree or before. It focuses on one attunement and teaches the principles of Psychic Surgery, Reiki Crystal Grid, and Spiral Meditation Sequence. The third degree is the teacher's degree, often referred to as "Master". No ego or ownership is otherwise involved in the term. The attunement involves spiritual level energy and achieves spiritual healing in the person receiving it. This energy is pure joy, oneness with all life, and connection with Source. In this level you will be attuned with 2 more symbols, and learn to teach and give attunements to your own students. What Is Feng Shui? Feng Shui (or Wind and Water) is the practice of arranging your environment so that energy or “chi” flows gently and smoothly through your home or business environment. In this way your space just feels good–and supports what you want out of life-whether it’s a better career, new romance, improved health, or more income. This unique therapy uses high–energy palm stones which have been formed by sedimentary and volcanic action. Hot Stone Massage brings about local and systemic changes in the body by emitting a profoundly penetrating heat that melts tension from muscles. It is a natural heat transmitting method that also reduces emotional, postural and physical stress while therapeutically relaxing the skin and muscles, reducing tension, increasing energy, and diminishing fatigue. The use of hot and cold stones (Thermotherapy) is also used to alleviate chronic pain as well as increase micro–circulation, oxygen intake, and orbital de-congestion. It is beneficial in bringing a feeling of balance and grounding to the mind, body and soul. Learn history, stone properties and technique of hot/cold stone therapy with holistic healer, Carole Tetreault. Carole has been practicing Hot Stone Therapy massage, Reiki and Quantum Touch therapies for several years in her practice at the Calder Healing House Bed and Breakfast. Whether you are a holistic healer, massage therapist or an individual who wants to use this therapy for family & friends this workshop is for you. Fairies are an elemental being put on this earth to spread their magic dust and assist the plant species. Who better to call upon when using plant essential oils from do Terra in a beautiful healing therapy. Corry and Carole merged their years of energy work knowledge through experience, guidance of spirit, and eastern philosophy of the Chinese, and Ayurveda. Join us for a magical day of dancing with the fairies in order to bring a holistic healing modality to you and your clients.